Each semester, WCE’s Professional Experiences Office coordinates internship and field experience opportunities for Watson College students in PDS partnership schools. In fall 2018, all placement schedules planned at the start of the semester had to be modified in October to accommodate extensive campus and school closures resulting from Hurricane Florence. 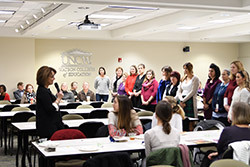 UNCW resumed classes on October 8, and students in New Hanover and Brunswick County returned to school on October 4, but many districts experienced even longer delays. In Pender County, students lost 29-30 school days due to the hurricane, and some schools in Onslow County did not re-open until November. Despite scheduling complexities, site coordinators at WCE partnership schools worked with WCE’s PET team to re-structure internships for 87 Watson College students. They also teamed to modify 2,246 field placements for 825 WCE students. 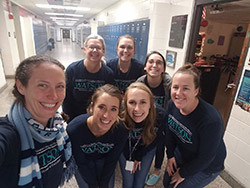 The restructurings involved moving 18 interns to different schools to ensure that WCE pre-service teachers would have sufficient instructional time in the classroom before the semester came to a close. As a personal thank you, with support from family and friends Wiseman raised $5,000 in gift cards to deliver to area schools adversely impacted by the storm.